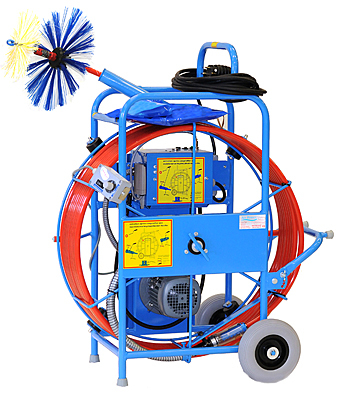 AirPower Reel Master has been developed for air duct cleaning. Both round and rectangular ducts can be cleaned with it. A 0,37kw/220v electric motor is used as the power source for the Reel Master. Thanks to its size and mobility, Reel Master is suitable also for working alone. AirPower Reel Master is ideal for duct sizes between 100mm and 500mm. AirPower Reel Master can be ordered either with a manual control with adjustable rotation speed or with a foot control. A wireless remote control unit can be ordered as an option for the manual control. - Two different types of flexible axle: soft for duct sizes 100mm – 500mm, hard for duct sizes 160mm – 630mm. The hard flexible axle can be used for pushing and pulling of the brush head also in larges ducts. Length of axles 20m - 30m. - Disinfection cartridge Master SR and Master JR. The disinfection fluid pressure tank can also be used with the disinfection cartridge.